According to a new national survey from Ottawa-based Abacus Data, the federal NDP is once again tied with the incumbent Conservative Party with each receiving the support of 35% of decided survey respondents. 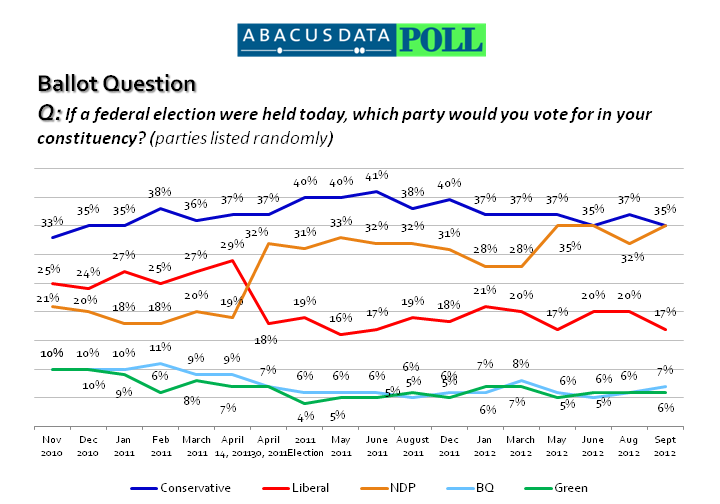 Since the last Abacus Data Federal Political Update in August 2012, the NDP is up three points while the Tories are down two points. The third place Liberals (17% nationally) are down three points. Regionally, the Conservatives lead in Alberta (58%) and in Ontario (41%) while the NDP is ahead in Quebec (39%), British Columbia (39%), and in Atlantic Canada (47%). The NDP and Tories are statistically tied in Manitoba and Saskatchewan. In Quebec, the Bloc Quebecois is up to 30% (+5 since August) perhaps a bounce after the PQ victory in this month’s Quebec provincial election. The Conservatives have a slight lead over the NDP among men (38% CPC vs. 32% NDP) while the NDP leads among women (39% NDP vs. 31% CPC). This month, the Abacus Data Political Report looks at some other noteworthy demographic and socio-economic differences when it comes to federal vote intention. The Conservatives do better among homeowners, those living in rural and suburban communities, among those living in households that earn more than $50,000 a year and among those self-identified Protestants and Evangelical Christians. The NDP does better among renters, those living in urban communities, among those living in a union household and among respondents’ whose household income is below $50,000 per year. The NDP leads among those who have no religious affiliation or self-identify as atheist. 41% of Canadians surveyed believed that things in Canada are heading in the right direction while 45% believed things are headed in the wrong track. This is largely unchanged since May. Quebecers and Atlantic Canadians were most likely to believe the country is headed on the wrong track. The approval rating for the federal government remained steady with 36% approving of its job performance and 46% disapproving. Tom Mulcair’s personal ratings improved slightly since August with 36% of Canadians saying they have a favourable impression of the NDP leader (up 5) while those viewing him unfavourably declined by 5. He remains the only federal leader to have a net positive favourable rating. Prime Minister Harper’s personal numbers declined slightly since August. For the first time in our tracking of personal ratings, 50% of Canadians surveyed said they have an unfavourable impression of the Prime Minister while 35% said they had a favourable impression. Only 13% have a neutral impression. The survey also asked respondents to rate three other individuals who were not singled out as possible Liberal Party leadership candidates but have been rumoured to be considering the race (well not Charest but some want him to consider it). Overall, Justin Trudeau had the highest favourable rating while Jean Charest had the lowest. The federal political environment is almost exactly as it was when Parliament rose for the summer three months ago. The Conservative Party and the NDP are tied. The Liberals lack a permanent leader and struggle in third place. About half the country thinks Canada is generally headed on the wrong track while another four in ten believe it is headed in the right direction. Prime Minister Stephen Harper remains a polarizing figure with one in two respondents saying they have an unfavourable impression of him while NDP Leader Tom Mulcair continues to be the only leader with a net favourable rating. The only difference seems to be a rise in the fortunes of the BQ in Quebec. While it may be temporary, it seems as those the BQ has benefited from the PQ’s recent provincial election victory. The BQ is now at 30% in Quebec in our tracking. Our polling suggests that some traditional demographic voting patterns may be blurring while others are re- emerging. The Tories lead among men and homeowners while the NDP leads among women and renters. But traditional divisions between urban, suburban, and rural voters may not be so clear. The NDP and Tories are competitive in all three community types as the NDP makes gains in rural Atlantic Canada while the Tories continue to dominate in Calgary, Edmonton, and be competitive in other major cities like Toronto, Ottawa, and Vancouver. We may also be seeing an electoral map divided more by region than other demographics. It may be too soon to conclude, but the electoral map is beginning to resemble a sandwich with the NDP strong on both the east and west coasts and in Quebec with the Tories strong in the centre of the country (Ontario, Manitoba, Saskatchewan, and Alberta). Regional tensions over energy, employment insurance, and economic development may further polarize the country over the fall and winter months.